Over the past few years, I've seen many clients who have come to me for a second opinion after seeing the same practitioner for far too long with little results. After a while it got me thinking; why don't people stop seeing someone if they're not getting results? I think back to when I was seeing someone for some health issues – she was LOVELY! She was so caring and really seemed to want me to get better. The problem was…I didn’t get better at all. It wasn’t until their clinic had a break over Christmas and I didn't rebook that I decided not to go back. Unfortunately, I hear the same stories in my rooms of people who see no results but keep going back. Now, I'm not so naïve to disregard the subset of the population who require ongoing treatment. What I’m referring to in this blog are the active and healthy individuals who injure themselves and seek treatment. Now if I didn’t care about people and wanted to create the perfect healthcare business model, it would be easy to tell people that they need me if they want to avoid worsening or persistent pain. I’d do a couple of massages and mobilisations and get people off the bed feeling better (who doesn’t feel a little looser after getting a massage? ), only to find that a few hours or days later they’re in pain again. And now if I’m really clever, I could tell this client, “see, you need my treatment to keep you pain-free” and use my knowledge and expertise to keep clients coming back out of fear. Now don't get me wrong, I believe that 99.9% of health practitioners are motivated to help people, but unfortunately, the problem arises when they truly believe that you (the client) NEED us (the practitioner) for life. Some healthcare practitioners also have the added pressure of income and accountability to their employer for retaining clients– you coming back to see them is good for business and fills their diary. And it is very easy as a healthcare practitioner to justify telling clients to come back because you have the belief that you can always help someone. We as healthcare professionals are generally empathetic people, and seeing a client for years means that we have the opportunity to develop meaningful relationships, which for most of us is truly rewarding. However, I see so many clients who stay with their practitioner because they're a "nice person," or they're "afraid what will happen if I stop going." 1. Did I get a chance to tell my story? I remember visiting a health care practitioner who was asking me very generic questions off his piece of paper and stopped me as soon as I went on a slight tangent. I remembered leaving his room thinking, “oh, I completely forgot to tell him about this!” Tangents are an important part of your story (1)… don’t keep going back to someone who doesn’t want to hear it. 2. Do they spend time educating me about self-management? Research is showing more and more that hands-on therapy, particularly in the long-term, can create reliance on health care practitioners. This leaves you feeling that you need someone to make you feel better, and you end up losing all sense of control over your own body. Your health professional should be empowering you to fix your pain (2). 3. Am I getting better? We as humans can be proud people, and find it hard to admit when we've reached our limit. And that can be a hard conversation as a physiotherapist to have with someone. It's not a matter of "you're beyond help," it's more that "you might be better suited to someone else" or "it might pay to have a second pair of eyes." It is very normal for a physiotherapist to believe that you’re not getting better because of you [not doing your exercises, having a complex injury, etc. ], not because of what they're doing. If you want to get better, don't stop looking until you’ve found someone who can help! 4. Have we discussed my goals and the direction of treatment? Has your healthcare provider asked you what you would like to achieve, and are you working towards it? If your only goal was to be able to get back to your regular walking and you've achieved it yet still being told you need to come back, either you need to chat about goals or move on. 5. Has there been a clear progression of treatment? 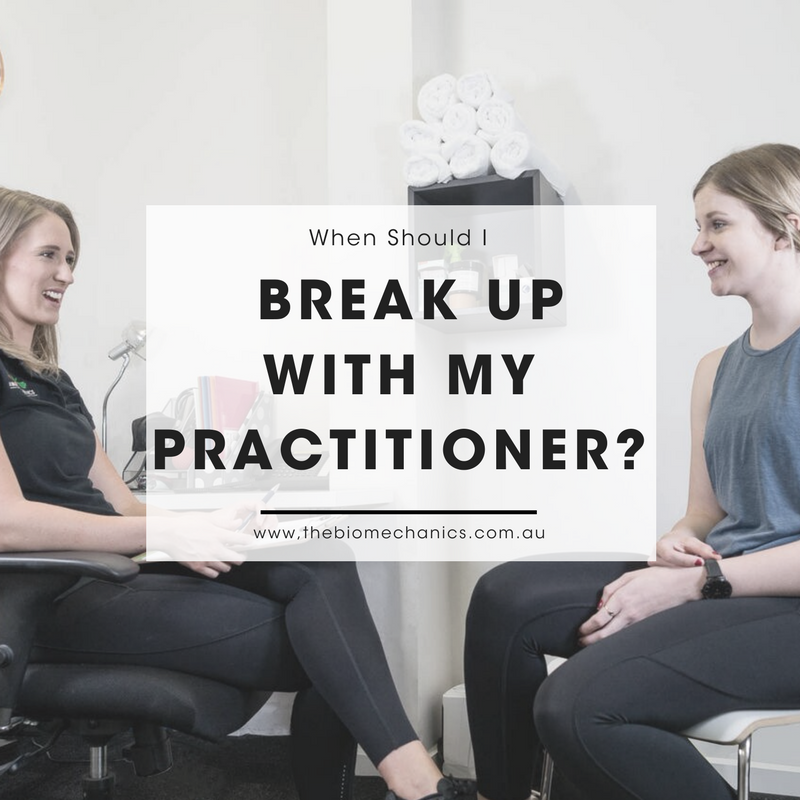 If you’re going in for the same hands-on treatment every single session then it's likely there's no next phase, and your practitioner has run out of options…it might be time to find someone else. The exception to this rule is if your next treatment phase is exercise and you’re going back regularly for motivation and accountability or because you enjoy the interaction. 6. Do I have an injury that won't "heal"? Chronic pain (pain over three months) is very complex, but what we know for SURE is that it is unrelated to tissue damage (3). The obvious exception to this is fractured bones or surgical intervention that requires months of post-operative rehabilitation. If your healthcare practitioner can't provide you with an explanation of why you have continued pain or tells you that it's because there's still damage and it's been months…it's time for a second opinion. 7. Have they given me hope that this injury will get better? One of the saddest conversations I’ve had with clients is when a practitioner has told them “you’re f***ed." Unfortunately, I've heard this many times. Aside from congenital abnormalities, of which are very rare, most injuries or pain shouldn’t last. Don’t let your practitioner take one look at your scan and tell you that you’re beyond help. We are complex creatures, and one scan isn’t enough to determine a prognosis (4). Your story is far more important than your MRI. These are just general questions to ask if you feel you’re not getting anything out of treatment. There are some exceptions, but it's important to feel empowered by your healthcare professional. Like I said before, some people see their practitioners for accountability or motivation, and this is great! The one question you have to ask yourself is “who’s in control?”…if it’s not you and you’ve become dependant on someone else to help fix your pain, then it’s time to see someone who puts the control back in your hands! (2) Coronado, R. & Bialosky, J. 2017. Manual physical therapy for chronic pain: the complex whole is greater than the sum of its parts. Enhancing chronic pain management for the manual therapist, 25(3), 115-117. Newer PostResolutions and Goals: Are you setting yourself up for failure?